SIM Tower was once a very popular PC Game and unfortunately there was no better successor to the game. Project Highrise wanted to revive the old times. This worked quite well, but did not give the game the same charm as the original. But now there is a new Title in the Room, which promises much. This refers to the game MAD Tower Tycoon from the Developer Studio Eggcode. Whether the game comes to the original, you will learn in the remainder of this Article. MAD Tower Tycoon is all about building its own Skyscraper, with countless Offices, Shopping Malls, Condos, recreational Facilities and a Hotel. At first we get some Money and are guided through a very easy-to-understand Tutorial, which explains the first steps. Here we learn the Control of the Game with Mouse and Keyboard, which is also very easy to handle, and how we build the first Facilities. We quickly learn that the Rooms in our Tower block must be supplied with Electricity, Water and Internet Connections in order to attract new Tenants. Also, we are very quickly made aware that the tenants need various Shops and Restaurants. Who likes to work when there is nowhere to eat? Of course, the food must be excreted somewhere after an extensive digestion, so we must also provide here for appropriate sanitary facilities. To attract Visitors, we build various Recreational Facilities, such as a Library, various Restaurants or even a Casino. To make even more Money, we combine this with the construction of our own Hotel with single or shared rooms, Condominiums and Security Facilities. As our Skyscraper continues to soar and the tenants refuse to accept our austerity measures in the form of stairs, we are forced to spend our hard earned money on Elevators. It all sounds very much like the SIM Tower – And yes, the game MAD Tower Tycoon is the first Game in a long time, which has taken the original to heart and this also wonderfully implemented in a new 3D environment. 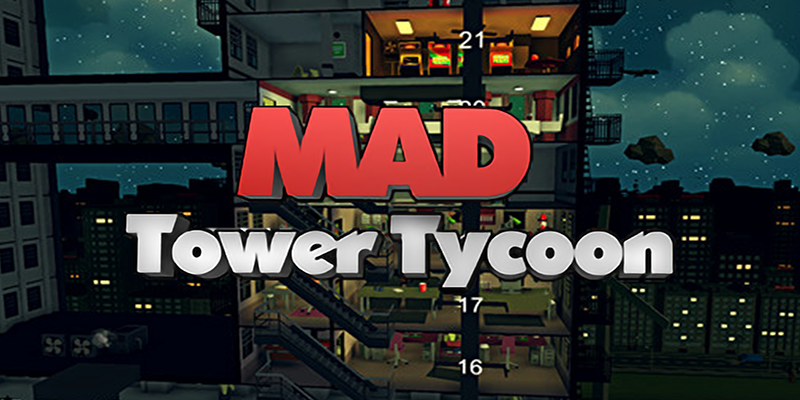 Anyone who loves SIM Tower will quickly feel at home with MAD Tower Tycoon. The Game offers several levels of difficulty, various Events, including Fires in the Building or even Aliens who want to kidnap our Tenants. However, these events can be switched off at the beginning of the Game. We from the Editors did this of course, because Aliens seemed a bit over the top. We also need to earn Experience Points in the Game to unlock new Buildings or bonus Skills that, for example, minimize the maintenance costs of the Rooms. The Music of the Game is quite nice, but annoying very fast, because it feels like there are only three or four titles, which are constantly repeated. The Graphics, on the other hand, are perfectly fine and presented in Low-Poly-3D Objects, which are set in scene by various Shaders. You can not say much more about MAD Tower Tycoon. It’s a wonderful SIM Tower Clone, Business Simulation, and we like it a lot better than Project Highrise. So if you want a modern version of the classic Game in your game library, you should definitely access it! We from the Editors liked the Game and looking forward to further Updates, because the Game is currently in the Early Access Phase.